After checking out some wackiness at carnivolution, I needed some vittles. 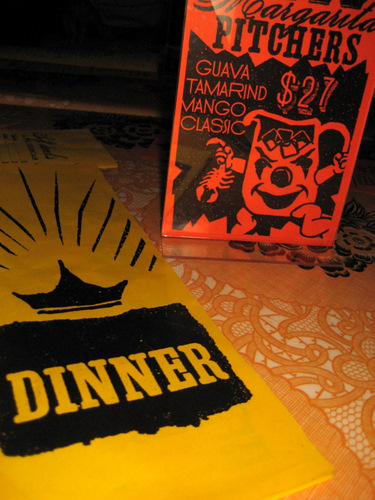 We headed back towards center city and somehow ended up at El Rey. I’d never heard of it before and we went there because it was a few steps from where we ended up parking the car. It turns out that this is a Stephen Starr restaurant! Who knew? The place is dark… extremely dark. And it’s got lots of velvet paintings inside. The decor at the bar is very cool. But I just don’t get this place. I think perhaps it’s not quite sure what it is yet either. 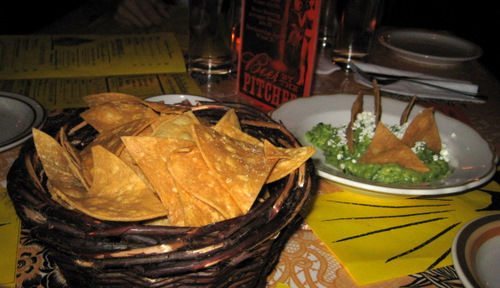 We got some guacamole with chips as well as the salsa with chips. The salsa was like a pico de gallo and pretty good. The guacamole was good too, and the bowl is quite large. They charge you $10 for it, but they give you plenty of guac. The chips were thick, crispy and crunchy, and not at all greasy. I enjoyed them. I think these are the skirt steak tacos. You get your filling in one bowl and you get a basket of tortillas. At $9, this seems like a pretty good value. I’m not quite sure what these are, and I’m not sure R did either when she ordered them. 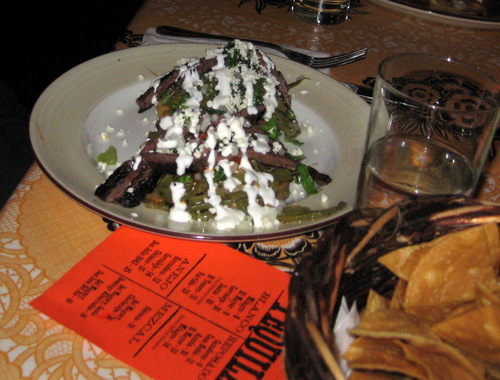 This is the Sopes – masa shells, skirt steak, salsa, onion, and crema. I don’t know. It looks like a plate full of slop that they squeezed some cream onto. I usually don’t care much for presentation, but really, this was a mess. Is this why this place is so dark? 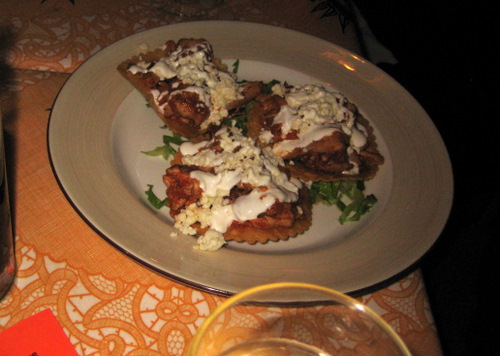 I think these are the chicken tostadas. They kind of look like open-faced raviolis, since the tortillas have cute scalloped edges. The presentation is kind of awful again, but you get three, which makes it quite the bargain. 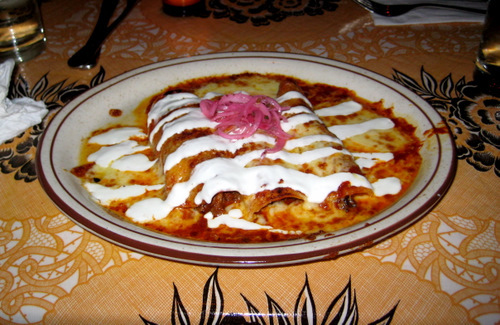 Here are some of the enchiladas. Looks like a typical plate of enchiladas to me. H/A thought theses were ok. 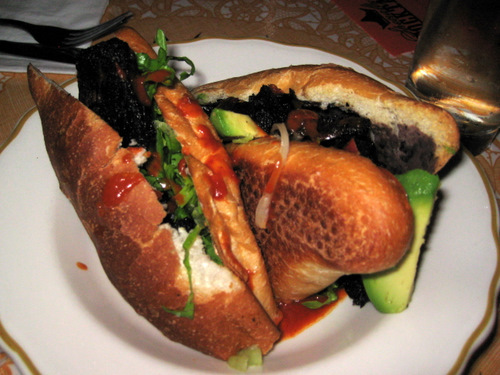 I got the short rib torta which was just ok. Look how burnt the meat is! Seriously, it’s like blacker than black. I mean, at least cut that crap off before you serve it to me. This wasn’t exactly like a torta I’d had in mexico, but it was ok. 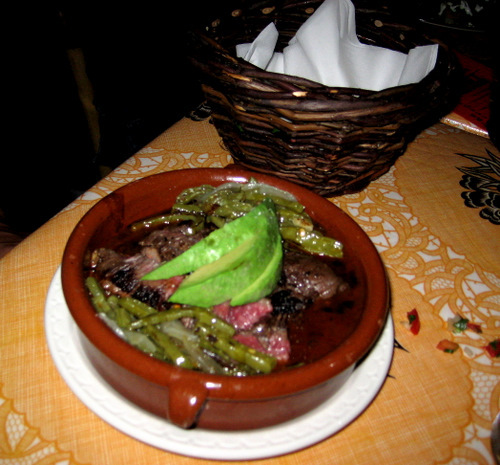 If the meat hadn’t been charred, I may have even liked it as there’s plenty of good stuff in it, like beans and avocados. You win some, you lose some, and damn Stephen Starr, this one is not a winner. I think it would probably be fine for just getting drunk and having some chips, but the food needs some work. We all ate our food because we were starving, but otherwise, we would all have been even more disappointed. One thing I will say, for a Stephen Starr spot, the prices are teeny tiny!